On Friday, March 28, Mark Seiss – the first “on-the-ground” statistician at Virginia Tech – successfully defended his doctoral dissertation in statistics. 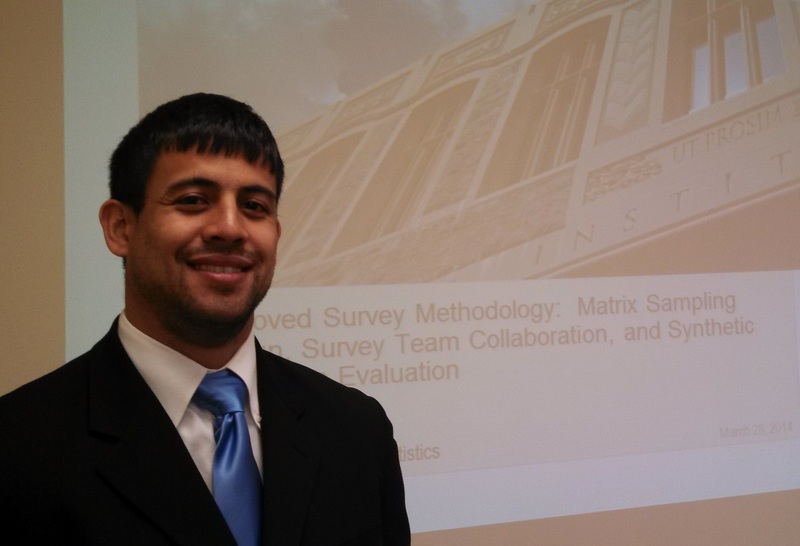 Mark’s research covers several aspects of survey methodology, from questionnaire design to final estimation. His first paper develops an approach to matrix sampling designs, where a subset of questions are administered to a respondent in such a way that the administered questions are predictive of the omitted questions. The proposed methodology compares favorably to previous matrix sampling methods when applied to data collected from a household survey conducted in Nampula, Mozambique. His second paper documents how statisticians can help improve the quality of data collected from surveys by carefully analyzing the data soon after it is collected. In addition to correcting data entry errors, the approach provides surveyors with continuous support throughout the fieldwork, enhancing their training and reducing the number of errors being made as the fieldwork progresses. His final paper proposes a model-based approach to the estimation of the mean squared error associated with synthetic (indirect) estimates. Mark applied the proposed mean squared error estimation methodology to simulated data and estimates from the 2010 Census Coverage Measurement (CCM). He found that the proposed mean squared error estimation methodology compared favorably to the previous methods in the literature, while allowing for area-specific estimates. I served on Mark’s doctoral committee with Eric Vance (committee chair), Leanna House, and Inyoung Kim. The pictures below were taken in 2011, when Mark acted as the “on-the-ground” statistician during a household survey in rural Nampula, Mozambique.